Cheski has an amazing ability to coach across a diverse range of people, ages, skills and learning styles. Learning to ride as a mature adult and being extremely naive about the challenges and learning experiences to be faced has been made easier - and fun with Cheski's unwavering support, guidance and encouragement - in both ridden and groundwork. Not only will you learn riding skills but also how to overcome the barriers in your own thinking! I can sincerely recommend Cheski as a coach whichever style of learning you have and for whatever goals you want to achieve. Had a great show at Woodhill winning the pony super series on Frosty can't be more happier with him thank you Cheski for all your help and coaching. 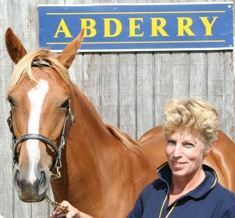 Why Riding Lessons (Coaching) @ Abderry? Because we offer friendly professional Riding Instruction and Coaching with Cheski for all ages and levels of riders on your own horse or pony. We provide a 'safe' place for you to learn and improve your riding. Because we offer both week day and week end time frames you can enjoy either private or group lessons for children or adults. Shared lessons are grouped so that your levels of experience are similar. Then every one gets the same opportunity to learn and have fun. Both one on one and shared sessions are for an hour - allowing for fitness of horse and rider. 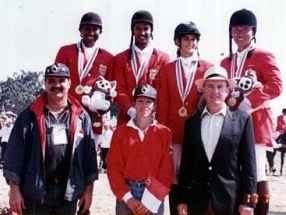 I came from a background of Polocrosse and general riding, a mature rider who wanted to jump! I had very little confidence to jump and a young horse, however, I was serious about achieving my goals so I wanted a coach that would guide, motivate and inspire me, push me a little bit beyond myself because she knew me, had faith in me and one I could trust. That is exactly what Cheski did and is still doing for me. It doesn’t matter what style of riding you have come from, what level you are at or where you want to go, Cheski has a sound understanding of horsemanship and horses, is a great communicator and has a vast range of visuals to help you understand new techniques. Her love and passion for learning, has her working with top international coaches and so in effect, I am too! A very positive person, Cheski can soothe difficult situations. She has taught me to believe in myself and in my horse. Nothing is ever a problem. Coaching times, weather…. Life! Cheski always seems able to fit me in and I have not gone home once without feeling on top of the world and excited about my next session! I have come a long way in a short time, as Cheski would say. You can do that! You have done that! And, now you are going to do that! We use Cheski as a coach for our 9 year old daughter Leah for many reasons but two stand out ones being that one, Leah is very shy. Cheski has managed to build a solid trusting relationship with Leah, taking the time to work out what makes Leah tick and how she thinks. Another reason being, Cheski has the knack of teaching children difficult riding concepts in such a way that they can understand. There's no dumbing it down because your nine, it's just lets approach this from a different angle. I feel she is genuinely committed to Leah's riding future. Private Session - $75 per rider. Shared Session $60 per rider. Concession rates available. $600 paid in Advance gives you 10 Lessons @ $60. Held on Account, used at your convenience. Cheski helps me to identify my goals and coaches me to get there. She sets a high standard for me, better than I would have thought I was capable of and then works with me to attain it. Every lesson I learn something new and I see rapid improvement in a short space of time compared to when I have worked with other instructors. We have a two way conversation and I am encouraged to think for myself which helps when she isn't there and best of all I have fun! Hi Cheski – thank you so much yet again. I smiled all the way home as always left feeling that Gnocchi and I had achieved a lot. You really are a remarkable coach! I booked in for a session of lessons with Cheski and my somewhat temperamental Arab Mare. I have only completed half of my course and both myself and my mare have improved impressively. Changes that I had made to my riding unconsciously over time were correctly identified in lesson one and we have been improving ever since. We always achieve something new and leave Cheski’s feeling that we have accomplished a goal. Cheski listens to your problems and finds a way to work with yourself and your horse to improve the overall combination. We are very lucky to have this facility available to us. I had the confidence to put another rider on the temperamental mare for a 40km ride at the weekend and the combination came in 1st. She will set you challenges to discover how you like to achieve and therefore gain confidence. Rather than tell you what to do with your hands and feet every step of the ride, she'll encourage you to verbalize your own options to improve your performance, then she'll let you (as long as she feels you've chosen a safe option) decide which option to try first. You'll be encouraged to analyse how you and your horse respond to each other and identify the consistent patterns that occur both when things go 'well' - and when things start to go 'wrong'. You'll learn to work out - should your horse be evasive - is it because he's 'naughty' or because he's finding it difficult and or uncomfortable to do his job 'properly'? The aim is for you is to understand why your horse reacts in a certain way. With this knowledge you can then make changes to your attitude and mindset and start to make things easier and achievable for both of you. If you can achieve in persuading, not forcing, a horse to work with you - you're developing your leadership skills. After all - horses don't fabricate respect and are usually at least five times bigger than you! Your horse's way of going often reflects the the way you're thinking. So if you're very tentative and unsure that your horse is going to react favourably you will probably be 100% right! Therefore we'll start at the start, working on the things you know you can get your horse to do and we'll work at your pace. It's your session so we'll concentrate on the things that are important to YOU. Having said this you'll be pushed and encouraged to work hard, but safely. Cheski can understand how it feels to be unsure around horses but doesn't believe we loose confidence. What some people call 'a loss of confidence' is what Cheski calls 'a gaining of wisdom' - now you understand the ramifications of being out of sync with your horse. Training with Cheski is not judgmental, she'll encourage you not to argue with reality. 'What Is' may not be 'What It Should Be' but it is 'What Is'! 'What else could you do? 'Did you ride that with the mindset of "Of course I'm Going to Achieve My Goal"? Cheski intends to provoke your thought process. The aim is to give you confidence - as long as you are in the right mindset, you do know what to do. This will help you know how to tackle challenges when by yourself, and don't have someone giving you instructions. You will be given exercises and routines to work on between coaching sessions. She'll explain how both you and your horse can be more tolerant of each other's fitness, soreness and anxiety levels. Cheski has spent over 26 years studying horse behaviour. She has developed a real understanding of how we can make life easier for our horses (and therefore ourselves) and has simple ways of imparting this knowledge. So many riders try too hard and are so concerned about 'doing it properly' and 'looking good', that spontaneity has been taught out of riding. At least you've made a start, got a base reading and have something to work on! You only make mistakes if you continue, over and over again, to keep using a formula that doesn't work. If you analyse your "mistakes" and then try a slightly different approach, they become training experiences which are wonderful things! Today was great, it feels like things are starting to make sense again. Mentally it has been a struggle jumping lately, but now I feel like I have a place to work from going forward. You really have made a huge difference to my understanding of where things are going wrong and opened my eyes to trying some options. It makes such a difference having someone listen to your fears and not make a joke out of what you find hard. Just calmly helping you work thru the issues. I always come away from your sessions on a high. Looking forward to our next session. Will give you a ring in a couple of weeks and book one in. Cheski holds a BHSII qualification and is a registered ESNZ Performance Coach for Dressage & Show Jumping and a Coach Educator. She regularly attends ESNZ and SPARC Coaching courses and is an enthusiastic student of the learning process. This necessitated a "what else can we do" attitude and plan to always have ready for implementation. 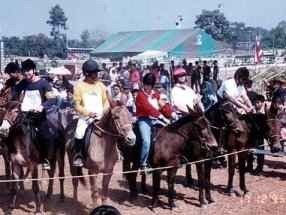 Just an hour after the SEA Gold Medal victory photo (upper left) was taken, Cheski was delighted with the opportunity to talk the talk and walk the walk - photo lower left shows Cheski (in red) at the start of the Mule race. She came from dead last - from a total braying standstill at the end of the first turn - to win by a head!